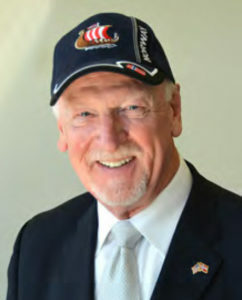 Honorable Perry J. Gulbrandsen (ret.) is a true friend of the Viking Ship! Judge Perry, who serves as an honorary board member of the Friends of the Viking Ship (FOVS), was instrumental in achieving the transfer of the trusteeship of the Viking from the Chicago Park District (CPD) to the Friends of the Viking Ship. Ownership now allows FOVS to pursue grants and major funding to preserve and properly house the Viking. Gulbrandsen, of Rittenberg, Buffen, Gulbrandsen, Robinson & Saks Ltd., and lawyer for FOVS, worked with Nelson A. Brown, senior counsel of the CPD and Matthew D. Shapiro from the Attorney General’s (AG) office in facilitating transfer of the trusteeship from the CPD to FOVS. Gulbrandsen’s work for FOVS was done pro bono. Except for a brief time (1994-2001) when a co-trusteeship existed between the CPD and the now dissolved American Scandinavian Council, the Viking had been in the care of the Park District for 92 years. After the Federation of Norwegian Women’s Societies restored and moved the Viking from Jackson Park to Lincoln Park, the ship was transferred into the care of the Commissioners of Lincoln Park for perpetual care on November 6, 1920. In 1934 Lincoln Park, together with several other parks, was consolidated into the Chicago Park District. The ship remained in Lincoln Park until 1994 when the CPD Superintendent required that it be moved to allow expansion of the Lincoln Park Zoo. Following a temporary stay in West Chicago, IL, the ship was moved to Good Templar Park in Geneva, IL, where it has been sheltered for 16 years. Although legal trustee of the Viking, the Chicago Park District set aside no funds for maintenance of the ship or its shelter. In August of this year the CPD concluded that it did not have the funds to preserve and house the historic Viking. In late June, the CPD filed a petition to amend the deed and trust and relieve it of its duties as trustee of the ship. Because the attorney general’s office represents the people of Illinois in charitable trust matters, the petition named Illinois Attorney Lisa M. Madigan as the respondent in the case, and the AG gave its permission. On August 8, 2012 the Chicago Park District agreed to transfer ownership interest to the FOVS. September 12, 2012, brought the three parties, together with many “Friends”, into the courtroom of Cook County Circuit Judge Sophia H. Hall at which time Judge Hall signed the agreed order. This final step in the transfer empowers Friends of the Viking Ship to pursue significant funds and grants for the preservation and housing of this magnificent historical artifact. FOVS is grateful to Perry Gulbrandsen for his significant role in making this transfer possible, and for his continuing support toward the preservation of the historic Viking.